President Obama wants you to sign up for health insurance, but some people still aren't buying. As technical issues continue to plague the sign-up process, health insurance executives met with White House officials to address the problems. 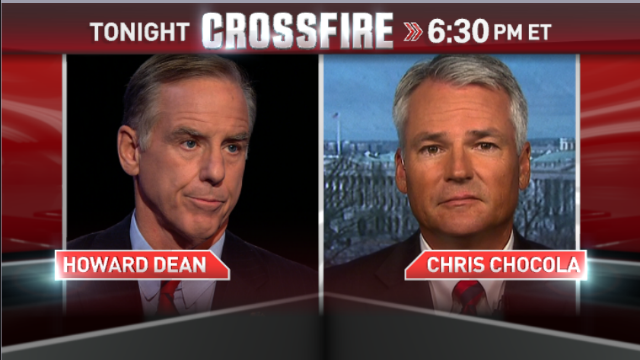 Former Vermont Governor Howard Dean and Former Rep. Chris Chocola of Indiana join Newt Gingrich and Van Jones in the Crossfire at 6:30pm ET Wednesday to debate Obamacare and whether or not there is a "plan B." Dean, a medical doctor and former head of the Democratic party, supports Obamacare. Chocola, the president of conservative group Club for Growth, is critical of the law. We want you to weigh in: Is it okay for the White House to host insurance executives behind closed doors? Large amounts of money have been spent so far into this program. Does it matter who they talk to so they can get it fixed?? The program just needs to get fixed, up and running without scrapping to start all over again. The costs would be to drastic. There's things I don't like about this law but the good out weights the bad. We are talking millions of people who don't have insurance, so of course the sight is overloaded. Anything new in technology has it flaws at first and in time works just fine. The law has already been helping children with pre-existing children since 2010. We can't take the needed care away from these children. There are also millions of adults who have pre-existing conditions, who now will get coverage with out all the hassle. The exchanges were set up for reasons. Insurance companies are competing for business now, the more people in these exchanges the lower the costs will be. Jobs have been created. Nearly 800 in AR alone from the Affordable Care Act. are opening soon. The government needs to do whatever it takes to make sure the system runs as smoothly and efficiently as possible from the programming system that was already built. Anything broken can be rebuilt but it all takes time. There is to much time and money invests to scrap the law or the website to start all over. There is no other or better plan. Love the comment that Howard answer to Newt's ideologue on not wanting to pay for insurance that he doesn't want. That was a good slam on Newt's face. Go Dean. Entertaining slams aside, I believe he tried to take a cheap stab at the Right Wing POV by stating his view is more "community" oriented. In the same statement he basically said he wants to tax everyone to pay for all births. The point of the ACA is to include more money from the young and those who don't need insurance to supplement those who need coverage for free/less; no amount of taxation could cover every birth in the USA. His whole mentality is flawed; the world isn't fair by nature, there's no way we'll make money/wealth fair or healthcare fair. We could help hinder the disparity. How about we stop the inefficient government from controlling more resource? Do we neglect this option because of their great track record? Wake up and look around. Socialized medicine leads to greater waste. USA has the highest cost/lowest satisfaction for healthcare of any industrialized nation. This all began when Reagan made healthcare for-profit. Now, the only factor driving healthcare provision and cost is corporate greed. It has become provider(supply-side) centered instead of patient centered. Private industry has proven unable to provide a quality product at a reasonable price. Because of Obamacare, insurance rates are no longer increasing at double digits /year, and in states where Dem govs want it to work, rates have nose dived. Who is going to get the money from the fines? Why didn't they makes the hospital, doctors and prescription companies lower their cost? And why does it have to be called Obama care? Why do they want to do everything at the holidays? I really think he had these companies in Washington to force them out. Why don't he speak to me and I could tell him how he expects us to pay for our bills and insurance. CNN, thanks for bringing back Crossfire. It's nice to see reasonable debate on TV. Please don't give in to any desires to make it sensational. Somebody should teach Newt how to find out diff. prices of health plans on healthcare.gov, because he doesn't know what he's talking about.